These looks from Gigi Hadid, Zoey Deutch, and Barbara Palvin, are cozy, cute, and perfect for fall. Every week, I scour the web to find inspiring outfits on your favorite celebs and help you recreate their looks! This week, I was inspired by Gigi Hadid, Zoey Deutch, and Barbara Palvin. Read on to see how you can get their looks for yourself. Gigi Hadid was spotted out in NYC wearing an eye-catching ensemble featuring a multicolored fuzzy jacket. Gigi wore her textured outerwear over a white turtleneck and gray straight leg jeans. She added a pop of print in the form of leopard print sock booties for her model-off-duty look. Gigi’s look features many of fall’s top trends, including a textured jacket. This multicolored sherpa jacket will give you a similar look to Gigi, and is a total statement piece. Plus, it gives off major cozy vibes. Wear it over a simple white turtleneck top and some gray straight leg jeans. Incorporate the print of the season with a pair of leopard print sock booties, and complete the ensemble with a black wristlet. Actress Zoey Deutch looked laid-back yet put-together while doing some shopping recently. She wore a pair of split seam jeans with a ribbed sweater in a dark red hue, and a menswear-inspired gray plaid longline coat. To keep her outfit casual, Zoey wore a pair of white Converse sneakers. 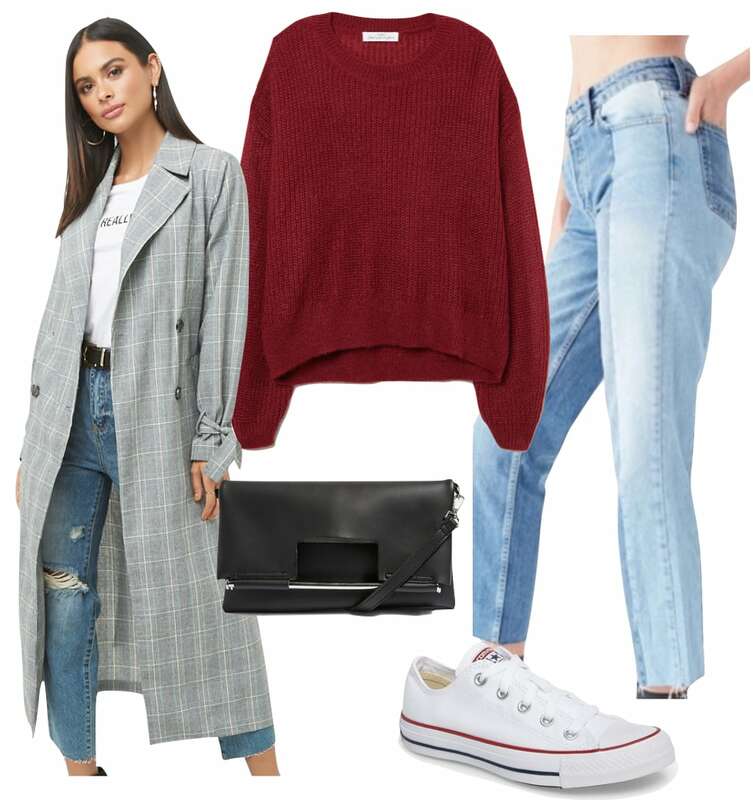 Menswear-inspired fashion is a major trend this season, and a plaid longline coat like Zoey’s gives even casual outfits a chic, put-together vibe. Wear the coat over a dark red ribbed sweater and jeans; these two-tone spliced jeans are similar to Zoey’s pair. Adding to the casual aspect of the outfit, wear a pair of white low-top Converse sneakers, and accessorize with a black shoulder bag. Model Barbara Palvin looked ultra cozy in an oversized, cream colored cable knit sweater and denim combo. Barbara wore her straight leg jeans with a pair of black leather booties and a black belt with a gold buckle. She also wore a black crossbody bag with gold detailing, and styled her sweater off one shoulder for added effect. Nothing says fall like an oversized sweater. Get cozy in an oversized, cream colored cable knit sweater and a pair of straight leg high rise jeans. Accessorize like Barbara with a black half-moon shaped crossbody bag featuring gold hardware, and a matching belt. A pair of black faux leather ankle booties bring the ensemble together.